Where to get the best Pho in Vancouver? What are the best Vietnamese Restaurants Vancouver? When it’s raining, it is always a good time for Pho Noodles. There are so many best Vietnamese restaurants in Vancouver. Everywhere you go seems to be the next best pho in Vancouver. The following restaurants list below are my favorites. They are tasty and hits the spot in their own particular way. Restaurants listed below are listed at random. Always a long line up; but always hits the spot. Do as your neighbours do and order the thinly sliced marinated butter beef loaded with garlic bits and cilantro. Also order the deep fried chicken wings with lemon dipping sauce. Their broth is MSG free and flavors are built by heat and bones. They make three different stocks daily from scratch everyday. Instead of the atypical hoisin sauce, they steep their own rice vinegar with tons of chili and garlic. Their deep fried crab meat spring rolls is one of the best! Their special Beef 7 ways and Oxtail Hotpot is a feast! Aside from your spicy beef pho noodles, Song Hyong also offers special dishes like steamed tapioca dumplings and rice rolls. Offers a variety of banh mì and pho options in Continental Plaza, Richmond. Their shredded pork baguette sandwich is really tasty. So is their dry noodles. This is a great stop if you are ever dying for a decent pho in Richmond. Pho Bo Satay 沙嗲牛肉粉 is Pho Tan ‘s specialty. On of the first in Vancouver. The broth has a good kick of heat and flavour. It reminds me of a Vietnamese version of Laksa. Served with thin fatty beef slices and al dente noodles. Pho Tam Surrey 歡心正宗越南牛肉粉 is not only the best pho in Surrey, but perhaps all of Metro Vancouver. Bun bo Hue The noodles are so bouncy yet soaks in all the soup! Beef flank, beef balls, congealed pigs blood, and a pork knuckle all inside this bowl of mildly spicy, sour and salty lemongrass piping hot bowl of pho. House Special Beef Noodle: Loaded with your usual thinly sliced fatty beef and garnished with white and green onions and cilantro. A light flavorful broth. 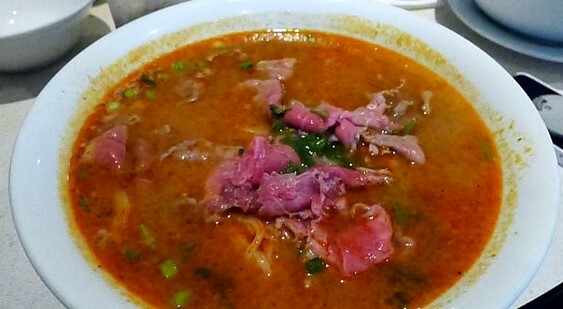 Bo Bun Hue aka Spicy Beef Pho Noodles is mildly spicy with predominant lemongrass flavors. Very spicy chili oil is added later into the beef broth. Where do you go for your pho fix? Let us know! We’d love to try!